Longitude found! The book has been published, the exhibition has opened, and so far all is going pretty well. Although, of course, there are things I would have liked to have changed or tweaked, I am really pleased with how both look and with the message that is, by and large, coming across. It’s difficult to get an impression of an exhibition through photographs, rather than actually being there. It is a three or even four dimensional experience that involves light, sound, space and (occasionally) touch as well as objects and text. It surrounds you and you move through it and across it over time. Nevertheless, because it was amazing for me to see it after so long existing only in lists of objects, label text and designers’ drawings, I put up a picture gallery over on The H Word, with captions that offer a whistle-stop tour. The exhibition has been previewed and reviewed positively. Maev Kennedy at the Guardian focused on Hogarth as well as Harrison, noting the rich variety of objects on display. In the Times [£], Libby Purves said that the story “is elegantly and excitingly displayed”. Richard Dunn, the lead curator (and my co-author), and Katy Barrett did sterling work talking to these and other journalists. They were also interviewed in an excellent slot on Front Row and Richard did a great job on BBC London. I helped out on launch day, and had also written a piece for BBC History Magazine’s July issue. The book has brought in some nice reviews too – there are two on Amazon so far (4 and a very nice 5 star) and this one on Robin’s Reviews, which calls it an “excellent, elegant book”. On 30 October I will be giving one of the Maritime Lectures at the NMM (probably on Nevil Maskelyne’s contribution to the longitude story, since I hope the collection of essays on him that I have edited will be out by then). I’m looking forward to all of this, but seeing it all written out is a little daunting! A lesson to share is not to take on a new lectureship in the same year as you have to deliver books, exhibitions and a large number of events – I also have a significant amount of preparation to do for my new autumn teaching (not to mention some chapters and reviews to deliver over the summer). Cross-posted from Science Comma blog. For those who are fans of sci-fi, or interested in how sci-fi plays into the history of science, there are some things you might want to take a look at. The lone (mad) scientist is a common trope in science fiction, but hidden away is a fascination with secret and semi-secret societies who work for the future of all mankind. This talk will look at the representation of the Royal Society in science fiction and fantasy as fact, fantasy and metaphor. For those who can’t make it to London, the talk should be available, like the Society’s other events, as a video afterwards. Secondly, yesterday saw the republication of the 1870-71 short story, The Brick Moon, by Edward Everett Hale. It is being published by Jurassic London, along with a new story, Another Brick in the Moon, by Adam Roberts. Details of the publication are available here, and also from this post by Richard Dunn, Senior Curator at Royal Museums Greenwich, who co-wrote the introduction with Marek Kukula, Public Astronomer at the Royal Observatory Greenwich. The original story is about an artificial satellite, the Royal Observatory, the Greenwich Meridian and possible solutions to the problem of finding longitude at sea. 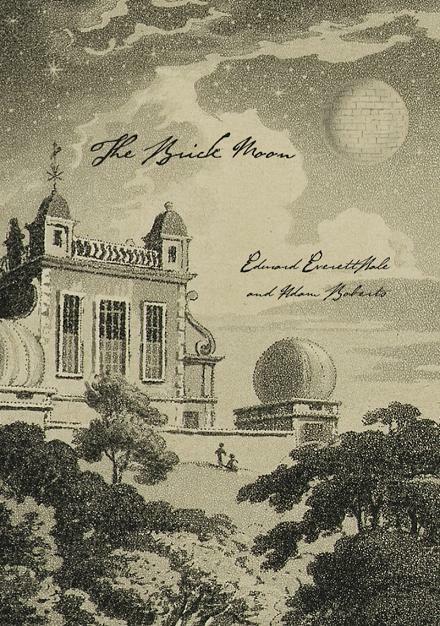 It is a perfect accompaniment to the Longitude Season, just getting underway in Greenwich.Secondly, yesterday saw the republication of the 1870-71 short story, The Brick Moon, by Edward Everett Hale. It is being published by Jurassic London, along with a new story, Another Brick in the Moon, by Adam Roberts. Details of the publication are available here, and also from this post by Richard Dunn, Senior Curator at Royal Museums Greenwich, who co-wrote the introduction with Marek Kukula, Public Astronomer at the Royal Observatory Greenwich. 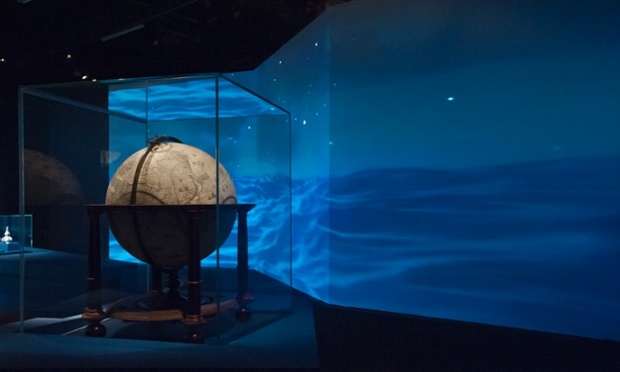 Finally, as well as a major exhibition on the longitude story (opening in July), this season also includes an art and fiction response. Already open at the Royal Observatory is Longitude Punk’d, an intervention in, or takeover of, the pre-existing longitude galleries. Author Robert Rankin and other artists and makers have come up with a whole range of more or less ludicrous or plausible ideas about solving longitude or alternative realities in which clock maker John Arnold made himself clockwork legs and Astronomer Royal Nevil Maskelyne built an airship and hoped to contact parallel universes – just in case they knew his longitude. Read more from the curator here.